Product Description: This CAT IV 600V safety rated analog clamp is a great tool for tough electrical applications. The RS-3 PRO works well in extreme temperatures of 32 degrees F to 5 degrees F, while digital clamp LCD screens tend to freeze this anolog clamp measures up to the test. 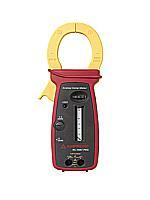 The RS-3 PRO does not require batteries for measuring Amps and Volts.